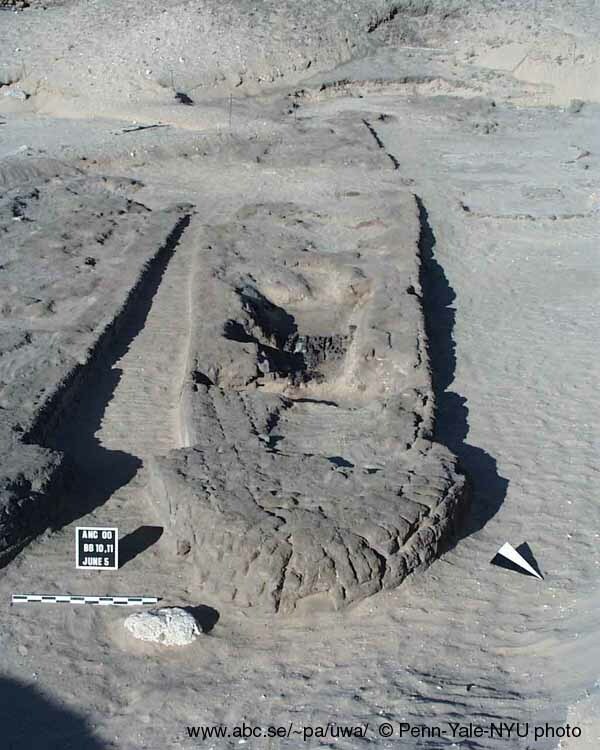 A fleet of the oldest built wooden boats in the world, located in the desert sands of Abydos, Egypt – more than eight miles from the river Nile – are painstakingly being excavated by archeologists. 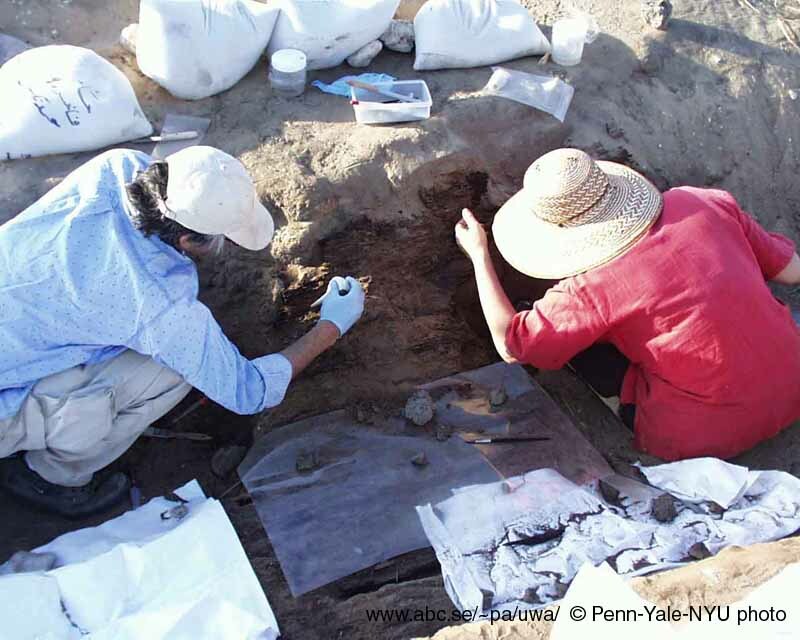 The work is revealing remarkable new evidence about the wealth, power and technological prowess of the earliest days of Egyptian civilization. The work is being conducted under the authority of Egypt's Minister of Culture, Dr. Farouk Hosni, and the Secretary General of the Supreme Council of Antiquities, Dr. Gaballa Ali Gaballa. 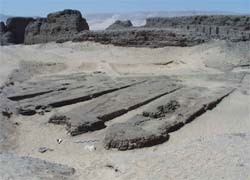 Part of the fleet of Abydos boats in their brick-built graves. 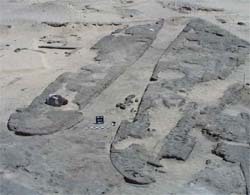 The two newly discovered (2000) boat graves are furthest to the left. In the background is the brick funerary enclosure of Pharaoh Khasekhemwy of Dynasty II. To date, 14 of the large vessels, dating from 3000 B.C. 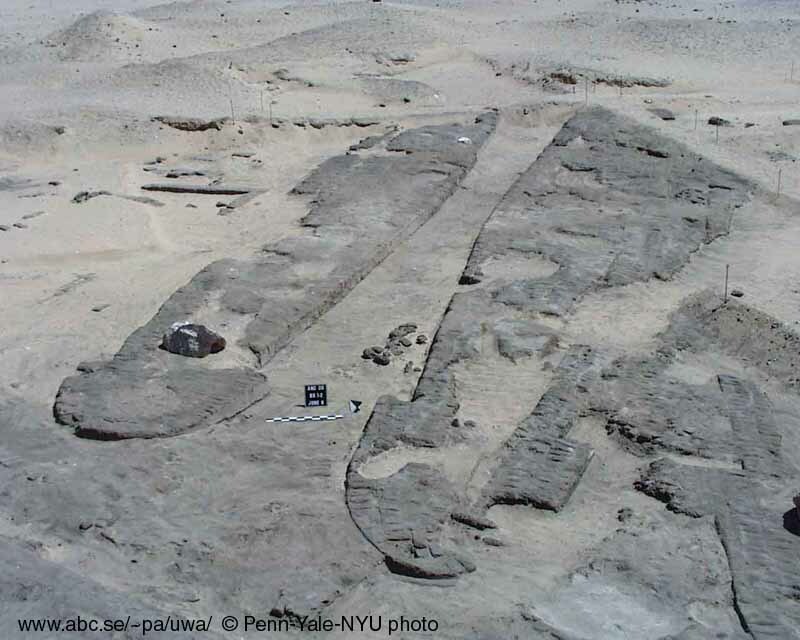 and estimated to be between 60 and 80 feet long, have been identified, and a large section of one boat has been exposed, conserved and studied by a team of archeologists from the University of Pennsylvania Museum, Yale University and the Institute of Fine Arts at New York University working under permit from Egypt's Supreme Council of Antiquities. The conservation component of the Abydos Boats project is financed by the Egyptian Antiquities Project of the American Research Center in Egypt, under its grant from the United States Agency for International Development. Dr. David O'Connor 1 has been working at Abydos since 1967 and is Project Director for the Abydos Boats project and co-director, with Dr. William Kelly Simpson of Yale University, of the long-running multi-faceted Abydos Expedition. Boat Grave no. 10, with part of the wooden planking of the actual boat exposed for study and conservation. "Ancient Egypt is a riverine civilization, yet before these boats were discovered, we knew very little – beyond representations on ancient pots – about ancient Egyptian boats earlier than the reign of Khufu, one of the greatest fourth dynasty pharaohs," noted Dr. O'Connor. "These boats provide us with a window into better understanding Egypt at the dawn of its extraordinary, long-lived civilization. Moreover, recent excavations have confirmed our original guess. These boat graves contain actual and viable boats intended for a king's use in the afterlife. They are in meaning and function the direct ancestors of the famous boat recovered at Khufu's Great Pyramid at Giza and predate Khufu's boat by perhaps as much as 300 years." 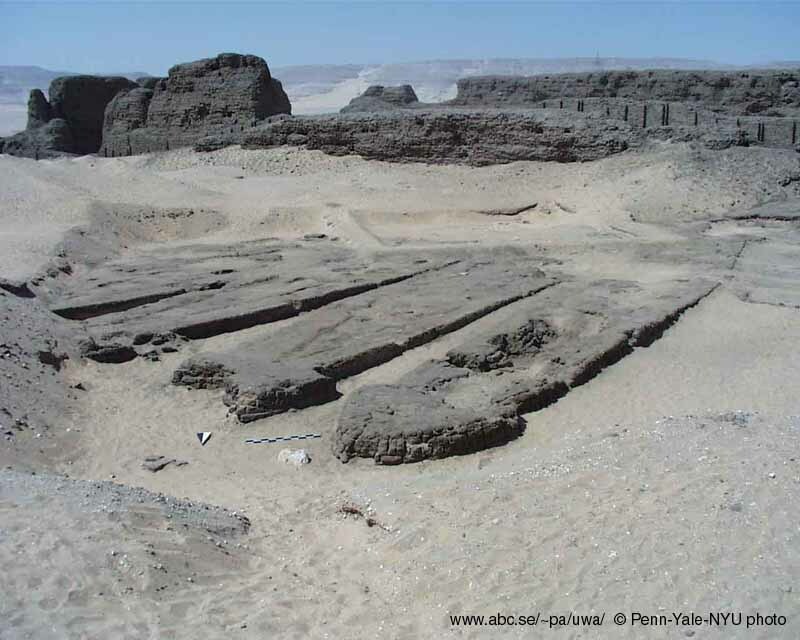 The Abydos archaeologists knew as early as 1991 that at least a dozen boat graves existed adjacent to a massive funerary enclosure for the late Dynasty II (ca. 2675 B.C.) Pharaoh Khasekhemwy. 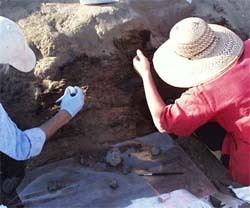 During the May/June 2000 excavation season, a team that included expert conservators and an ancient boat specialist was able to establish that the boats were placed in their graves many years before Khasekhemwy's funerary enclosure was built – so that they were intended for the afterlife of a much earlier dynastic ruler, perhaps even Aha, the first Dynasty I (ca. 2920-2770) ruler of Egypt. Boat Grave no. 10, with part of the wooden planking of the actual boat exposed for study and conservation. 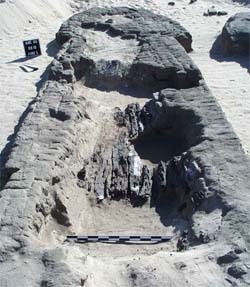 Visible at each end are pits cut into the boat grave have destroyed the planks. And while precise dating, through carbon 14 testing (only accurate to about 200 years), remains to be determined, early excavation of a ten-foot portion of one of the wooden hulls has already yielded surprising results: the archaeologists now believe the boats were not models, as many mortuary-associated objects could be, but viable vessels which could accommodate as many as 30 rowers. According to boat expert Cheryl Ward, the mode of construction is unique among surviving ancient Egyptian boats. About 75 feet in length and seven to ten feet in width at the widest point, these boats are only about two feet deep, with narrowing prows and sterns. 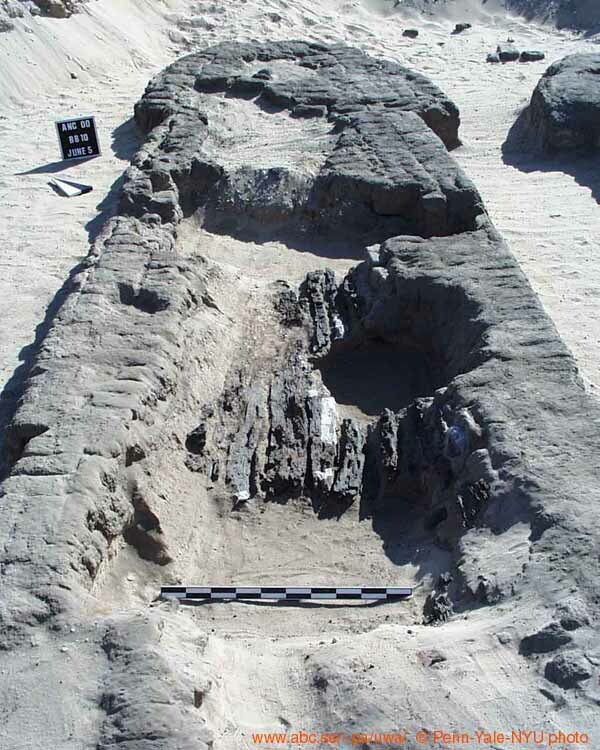 The portion of the boat hull excavated revealed thick wooden planks, lashed together by rope fed through mortises. The seams between the planks were filled with bundles of reeds, while additional reeds carpeted the floor of the boat. Internal framing – a universal aspect of later shipbuilding – is not in evidence, and some of the boats in their graves appear twisted or lopsided, symptomatic of vessels without an internal structure to support them out of the water. Moreover, residue of yellow pigment indicates that these boats were probably painted. The Associate Director for the Abydos Boats project is Matthew Adams 2. "Discovering such a fleet of wooden vessels this early in Egypt's history offers extraordinary insights into the wealth and power of Egypt 5000 years ago and the promise of new information as the boat excavations and conservation efforts continue," said Mr. Adams. "The wood alone tells us so much. Wood was a precious commodity in Egypt, and when we determine the type of wood we'll be able to pinpoint just where it came from – which opens a whole new avenue of understanding about trade, political relationships, and power." 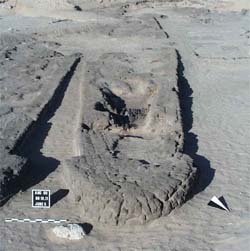 Two of the Abydos brick-built boat graves. The graves each contain a wooden boat that was filled in with brickwork. In addition, each brick boat grave is itself shaped to represent a boat. Boats figured largely in ancient Egyptian life, where few people lived far from the life-giving Nile River. The Abydos boats appear to be the prototype of the pharaonic boats that appear, both real and in symbolic form, in funerary contexts much later in Egyptian history. Egyptians believed that the king, or pharaoh, at his death joined the sun god Ra, sailing in his boat down the heavenly Nile. The most famous and elaborate of these boats – featuring carved prow and stern and a deck cabin – was found in a boat grave at the Great Pyramid of Giza, attributed to the Pharaoh Khufu (ca. 2500 B.C.). No intact boats had been found of earlier construction – until now. The preliminary conservation study on the first boat hull is helping to shape future seasons. The archaeologists plan to return to boat excavation work this winter in order to minimize the damage from the sunlight and heat, which cause quick deterioration of the fragile wood. Although conservators Deborah Schorsch and Lawrence Becker expected and found significant insect damage from wood-eating ants or termites, the wood was still sufficiently intact to be treated and removed, with fragments of rope and much reed material, for storage and study. In future seasons, boat expert Cheryl Ward will be examining the wooden planks microscopically to glean evidence about the manufacture, transport, and use of the boats prior to their placement in the mud-brick "graves" of Abydos. Conservators Lawrence Becker (L) and Deborah Schorsch (R) working on the treatment of the exposed wooden planking in Boat Grave no. 10. Archaeologists hope that material evidence found in and around the boats may eventually help with dating and better understanding the royal fleet – and Egypt in the first dynasty. More than 30 pointed-bottom pottery jars, about a foot tall and of a shape that typically was used to transport beer, were found near one of the boat graves. Excavators found seal impressions, too deteriorated to be legible, from the jars' stoppers; more impressions of this sort are anticipated, and may even yield the name of the king for whom the boats were interred. The team will also be looking for evidence or remains of any boat gear – oars, rudders, dismantled seats, intact prow and stern (the test boat's prow was too disintegrated to provide clear information), as well as evidence for the boats' decoration. 2: Matthew Adams, Research Associate, Egyptian Section, University of Pennsylvania Museum, and the Institute of Fine Arts, New York University.